Waipara and Martinborough are both small regions producing some excellent Pinot Noir along with a smattering of aromatic white wines. Looking at a map the regions share some similarities in terms of geography. 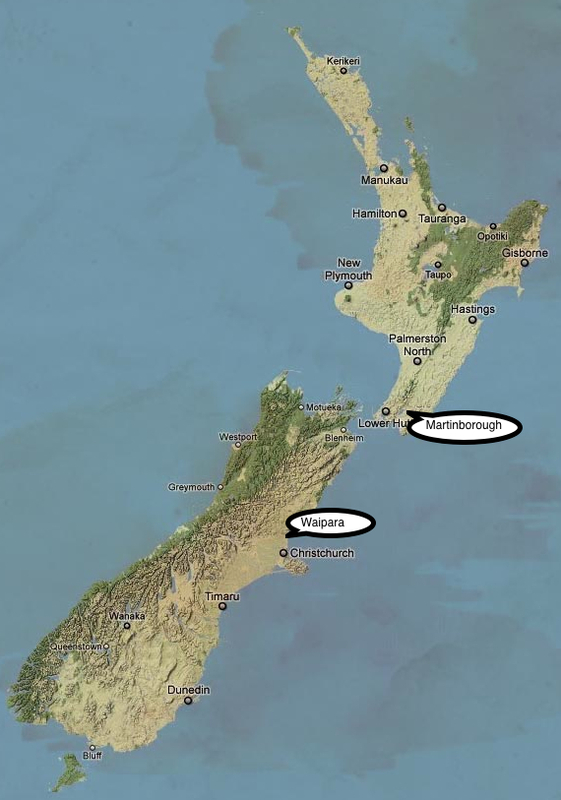 Both are located on the east coast of the country; Waipara in the South Island, roughly a one-hour drive north of Christchurch sits at latitude S43˚ and Martinborough in the east of the North Island at S41˚ is also an hour in the car from another of New Zealand’s major cities, Wellington. The Waipara Valley (not to be confused with the tongue twister North Island region of Wairarapa) consists of three main sites; the valley floor, the hill slopes and the river terraces. 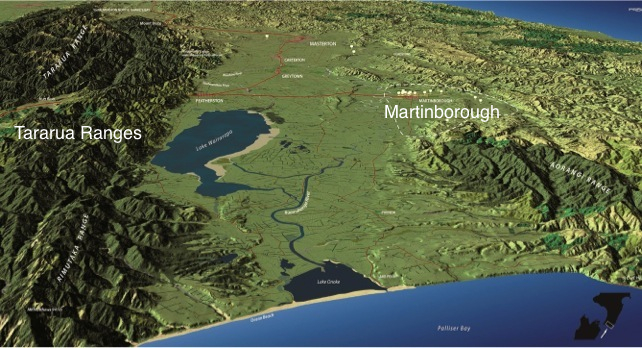 This sub-region of Canterbury is situated at the foot of the Tivotdale Hills, which provide shelter from the cool easterly breezes of the Pacific Ocean. To the west of the region further afield are the Southern Alps and closer to the town are the Three Deans mountain range, which all help to keep the warmth from the sun in the area. Add to that warm north-westerly winds and long dry autumns and you have a good ripening period for the grapes and wines that exhibit a lovely spicy character. Martinborough, in the North Island enjoys similar protection from the winds as provided by the Tararua Ranges to the west, although this region is open to the blustery winds from the east as they come in off the Pacific Ocean. Growing up in this area, but on the western side of the Tararuas, I remember autumns of cool nights and mornings followed by days of brilliantly clear blue skies as the temperature slowly climbed out of single digits. This is true also of Martinborough – the region experiences a high diurnal range, that is to say a big difference between the temperature at night and the temperature during the day, and this is perfect to ensure the grapes ripen sufficiently. 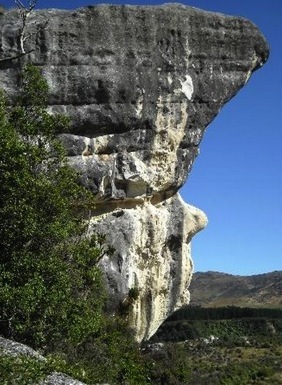 Bishops Head winery in Waipara is named after a large limestone rock face deep in the Waipara Gorge. In addition to Pinot Noir, Bishops Head also produce a range of aromatic white wines. Drawing on experiences from around the world the winery fnds itself looking towards Europe for its stylistic template – all the while overlaid with an understanding of the localness and the unique characteristics brought to the wine from the particular sites on which the vines are grown. Image credit: Bishop’s Head, Waipara Gorge. Bishops Head Winery. During a superb dinner at Mott 32, the 2011 Pinot Noir and the Pinot Gris of the same vintage were the standouts of the night. The Pinot Gris was full of ripe round stone fruit and white flowers. It had great texture and weight on the palate without being too heavy, good length and attractive mineral complexity on the finish. The Pinot Noir showed typical notes of red fruits, spice and violets along with the first hints of forest floor, mushrooms and a touch of cedar. The grapes are hand picked and a portion of the stems left on during fermentation. Natural yeasts are put to work and French oak is used for maturation. The tannin and acid structure formed a solid foundation on which to hang complex flavours, which in turn matched perfectly with the crispy duck we were served. Keeping on the Pinot Noir theme and the look back to Burgundy for inspiration brings me to Escarpment Vineyards in Martinborough, owned in part by the New Zealand “godfather of Pinot Noir”, Larry McKenna. Having moved from his home of Adelaide some years ago Larry’s first work in Martinborough was at Martinborough Vineyard in the 1980s. 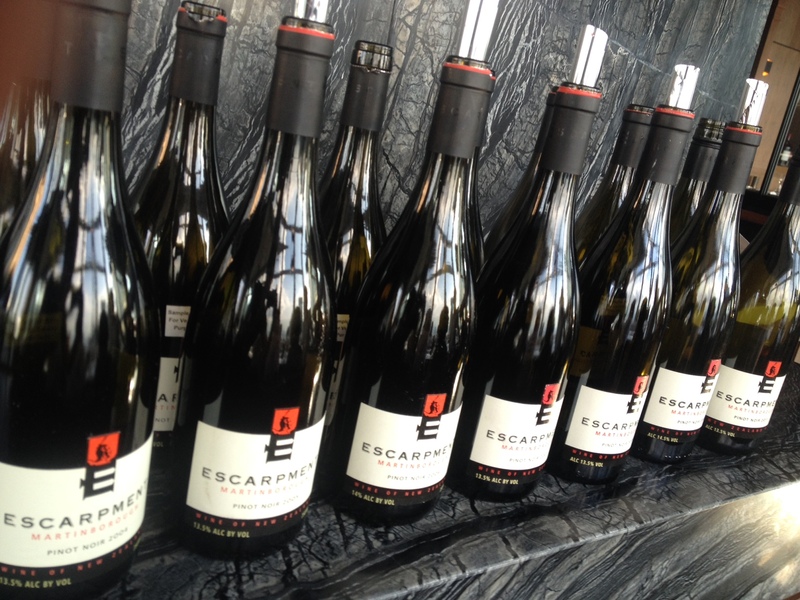 Then in 1998 he, in partnership with the Kirby family, established Escarpment Vineyards. 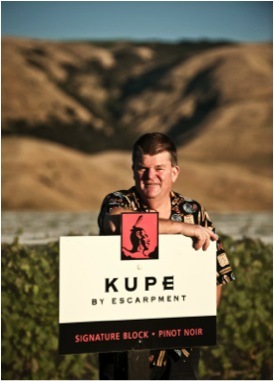 Image credit: Larry McKenna at Kupe Vineyard, Martinborough. Escarpment Vineyards. Escarpment has always peaked my interest, as the 2008 Escarpment Kupe single vineyard Pinot Noir is one of those wines I have never forgotten. A special dinner out in Wellington some years ago with dear friends and this was one of the wines we enjoyed. I remember it because although we were deep in conversation the wine quietly requested – or rather, insisted – on slightly more of my attention than I had given. My first sip taken mid-conversation resulted in my having two conversations – one at the table, the other in my head as my senses were distracted by the layers of flavour unfolding in my mouth. So here I was in Hong Kong and being invited to attend a tasting of the Escarpment Range from 2004 – 2011, how fabulous! An engaging speaker, Larry took us through the range describing the vintage conditions and approach to winemaking for each of the wines. The Escarpment Range is no exception in reflecting Larry’s approach to making wine. It is a style that looks back to Burgundy, being heavily influenced by the winemaking of Domaine Dujac, whilst at the same time creating a truly unique representation of the place from which it comes. The 2004 with its lovely tertiary notes of leather and dried fruits alongside good acidity and a lovely dose of herbal notes was one of my favourites. At the other end of the spectrum I also enjoyed the 2011, all black fruit and spice with the delicacy of fresh violets and pencil shavings on the finish. At dinner the following evening I was lucky enough to taste the 2011 Te Rehua, another of the single vineyard expressions which includes the aforementioned Kupe and the Pahi and Kiwa labels. As with the Kupe this was a standout and it generated much discussion at our dinner table, mostly around how to get one’s hands on more of it! Escarpment as with Bishops Head also produces a range of white wines, which I must admit I didn’t know too much about. Having tasted through the Pinot Blanc, Pinot Gris, Chardonnay and Riesling (both dry and late harvest) I would recommend seeking them out. The Chardonnay in particular was a delicately crafted, refreshing expression and I am looking forward to enjoying a bottle or two more at some point in my future. New Zealand’s reputation as only a Sauvignon Blanc producer has been expanded to include other varieties, most notably Pinot Noir, and although not as large as some of the other Pinot Noir producing regions I would encourage you to seek out wines from Waipara and Martinborough. And while you are at it, you might as well grab a couple of bottles of their outstanding white wines too!